A form of signage that projects at a right angle from a commercial property in order to advertise to people walking by. Common forms include light boxes and hanging signs (both wooden & aluminium). An extremely common and versatile form of traditional signwriting popular across all types of commercial properties & retail outlets. Most commonly used on wooden fascia boards and hanging signs. Available in solid colour, digitally printed, and UV printed styles, window graphics are an easy and affordable way to make your shop front attractive and memorable. A free standing form of signage typically displayed on the pavements in front of shops and restaurants to people walking by. Styles range from simple metal frames to bespoke displays. A form of signage commonly used for interior wall displays, reception signage, and stand off signs. Available in a variety of colours and thickness’s. Ranging from solid colour decals to digitally printed custom wall paper, our design and install team are experienced in all types of custom wall graphics and branding. A form of 3D lettering. LEDs mounted inside are commonly used to illuminate an acrylic front face, or to create a halo lit effect.  Often used in retail fascia signage as they are large and attention grabbing. Laser or CNC cut from a solid block of material. Common substrates include acrylic, aluminium (brushed, mirrored, or powder coated), stainless steel, titanium, brass, wood, and many more. covering everything from one off display plinths to full shop interior refurbishment. Our team will work with you to create custom made displays that are designed and fabricated with your needs in mind. A classic form of signage that is bright and attention grabbing, with a distinctively retro feel that is truly unique. It comes in a variety of colours and sizes, and can be custom made to any shape. Bright, attention grabbing form of exterior signage. Characterised by a aluminium frame with an opal acrylic face and vinyl graphics, which are illuminated from inside by fluorescent tubes (LEDs also available). Bespoke signage, involving two or more matching styles (fascia signs, way finding, monument signs, etc.) which work together to create a uniform Look with the style of building to which they are installed. covering everything from single colour text to full body vehicle wraps. We offer in house service for all aspects of vehicle livery, from design straight through to installation. Usually fabricated from aluminium or aluminium composite, our trays can be built to any size and powder coated to any colour. Can be made to house LEDs, and router cut to allow for push through letters. Window etch film can be applied to any glass surface for privacy (not blocking out natural light), window manifestation, It is common in office spaces and residential buildings. Engraved or chemically etched from stainless steel, brass, aluminium, and bronze. The etching can be filled with any colour, or a combination of colours to match with your corporate identity. Got a crazy idea and no clue where to start? Our team has experience in a variety of trade disciplines and skills (carpentry, metal work, electrical work, graphic design), and are happy to provide guidance for any project. Inexpensive and custom printed aluminium composite panels for build and renovation sites. They are available in a variety of styles and colours, and can be produced with a relatively short turnaround.